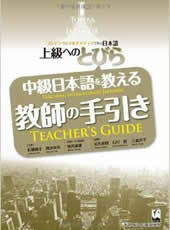 The Tobira Teacher’s Guide accompanies the textbook Tobira: Gateway to Advanced Japanese. This guide explains the features and goals of Tobira, and provides general insights for teaching Japanese at the upper-intermediate level. In addition, it offers specific suggestions and ideas as aids in teaching the book’s contents (readings, oral activities, grammar, etc.) effectively. The guide also contains English translations for the main text and the example sentences in the grammar notes, as well as suggestions for utilizing the related Tobira resources, including the Tobira site, LPO materials, Power Up Your KANJI, and Grammar Power: Exercises for Mastery. By combining these instructional tools with reference materials at the Tobira site (sample schedules, teaching plans, projects, quizzes, exams, etc. ), this guide is an indispensable resource for instructors using Tobira to prepare students for courses in advanced Japanese.